Amazon shoppers - give us a helping paw this holiday season! Just go to smile.amazon.com. Pick "Pets in Need - West Michigan" as your charity of choice. Amazon Smile will send Pets in Need a little donation when you buy eligible items. It won't cost you a penny to donate to us while you shop! And, you'll also be helping out my dog dash, who hopes he will not have to pose for any more photos while wearing silly holiday hats! Another precious life saved through Pets in Need - West Michigan! Meet Pika - this sweet girl had a severe infection called a "closed pyometra". Her pet parents could not afford the cost of surgery, without which she would have died. 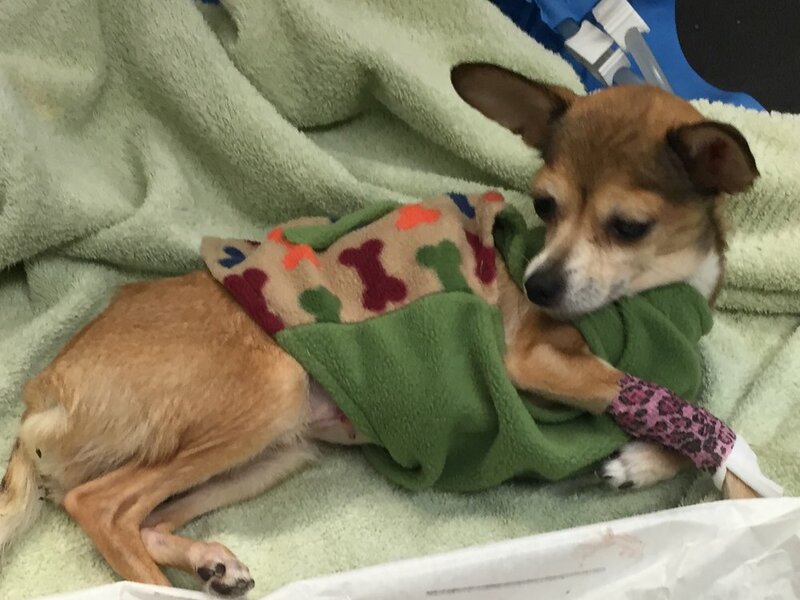 Pets in Need was able to step in and perform the surgery and save her life. It was a blessed day for all of us. Please consider donating to Pets in Need through this website. Help us save more precious animals like Pika!!!!! If you need help with your pet, please contact PIN through this website! Dear Pet Lovers - Pets in Need mainly provides dental care for pet parents who cannot afford it. In order to qualify for PIN dental care, you must either meet standard poverty guidelines or be referred by a veterinarian. Specific requests made through social service agencies will also be considered on a case by case basis. If you need help, please contact PIN through this website. Currently, our full time staff consists of exactly one volunteer who also works full time somewhere else. Therefore, our services are quite limited at this time. We are happy to answer your questions and if PIN can't help you, we will try to steer you toward someone who can. PIN's dream is to someday have a place of our own with full time hours of service. For now - we do what we can without a place to call our own, or even our own phone number. Thank you for your understanding! You can donate to Pets in Need while you shop on Amazon.com - and it won't cost you anything but a minute of your time! Next time you shop on Amazon.com, sign up for "Amazon Smile" and choose "Pets in Need - West Michigan" as your designated charity. Just click on the following link and you will soon be all set. Thanks a million! We're excited to get started! Stay tuned for more information.